Anyone who has ever owned a pet can tell you exactly why a dog, cat, or other companion can help with your grief. If they are scientifically minded, they might cite actual evidence. They can point to things like the release of oxytocin (the bonding hormone) and dopamine when petting or even just making eye contact with a pet, or they might tell you about the reduction of cortisol (the stress hormone) when interacting with a furry friend. Or they may prefer a personal approach, and simply bring their pet and let you see for yourself how a few puppy kisses and a purring cat on your lap make all the difference. It is no wonder, then, that animals are often used to assist at places where emotional well-being is needed. Nursing homes often have pets who live on site or who make regular visits for some playtime. Children’s hospitals will sometimes do the same (for kids who are not restricted by their health). Trauma recovery centers and disaster relief will sometimes include animals as a way to reach out to people. And although you don’t see many animals wandering around funeral homes, there are some that have a grief therapy dog on site to help with the newly bereaved—particularly children who have just lost a parent, sibling, or friend. What is a Grief Therapy Dog? A grief therapy dog is an emotional support animal whose job it is to assist people undergoing trauma associated with the loss of a loved one. 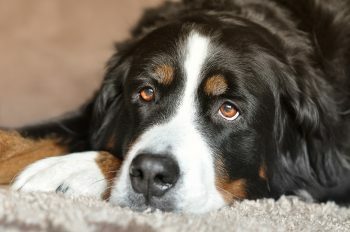 Although you cannot necessarily take this type of dog on an airplane with you or bring them along to a grocery store (the same way you might a guide dog or diabetes alert dog) due to public health laws, there is a growing trend in people and organizations turning to these animals as a way to help people cope with loss and bereavement. These dogs are not trained in specific skills like guiding a person who is visually impaired or finding help in the event of a seizure. Instead, they are trained to be very loving, very attentive, and very stable. They can sense when someone is grieving or feeling down and will sit patiently with them for as long as needed. Many different breeds are suitable for this type of work, but Portuguese water dogs, Bernese Mountain dogs, St. Bernards, and Golden Retrievers are particularly apt for this work. As you might note, these are all very large, very fluffy dogs. That is because their size and texture are intended to bring comfort. They also have very mellow temperaments, making them ideal when in a public setting or when working with kids. How Do I Get a Grief Therapy Dog? If you or a loved one recently experienced a loss, you may want to look for a grief therapy dog to provide assistance and comfort. The first thing to remember is that a therapy dog is still a pet, which means it is a lifelong commitment that requires daily care, attention, food, and medical visits. You can either purchase a pet trained by a service animal organization to provide emotional support, or you could visit the nearest animal shelter and find a dog or cat to capture your heart. Although you won’t get the same level of training with the latter option, it is much more affordable and offers many of the same benefits. You can also look for an organization in your area that provides temporary grief therapy assistance. Some will allow you to visit and hang out with as many animals as you need (they may even have volunteer opportunities). Others might “rent out” their grief therapy animals for when you need them most. It is also important not to overlook the benefits of simply calling up a close friend with a dog and ask them if they can come by with their furry friend. Having that company—both human and canine—can go a long way in helping to soothe your grief. I Want to Plan My Own Funeral, Where do I Start?